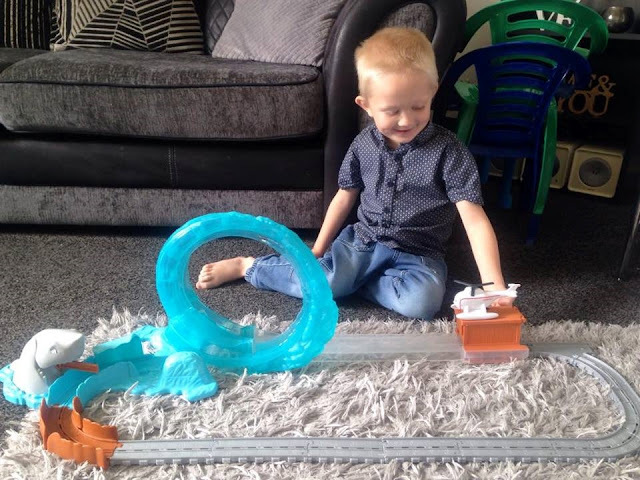 If you follow the blog regularly you will have seen that we recently visited the fabulous Thomas Land at Drayton Manor over the Easter holidays, and as such Riley is very much into everything Thomas & Friends™ related at the moment. 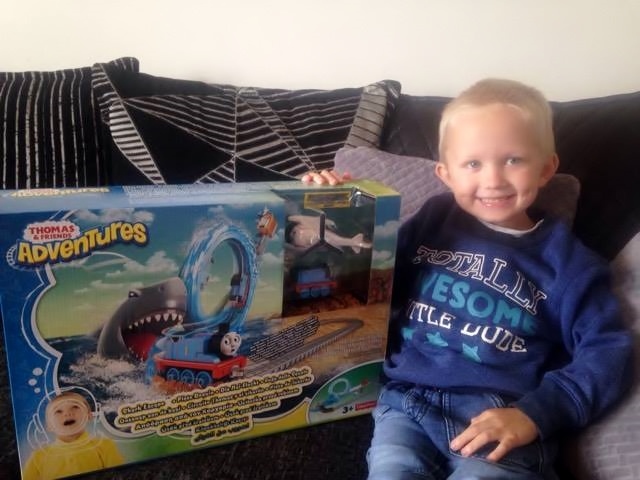 It was therefore a lovely surprise for Riley to be offered the chance to test and review the new Thomas & Friends™ Adventures Shark Escape! playset, which is the latest track set from Fisher Price. I told him that he had a surprise coming in the post for him, and so he eagerly waited for the post man over the next few days. Once it arrived I told him to close his eyes and I placed it in front of him in order to catch his very first impressions of it on camera. As you can see, the smile says it all! 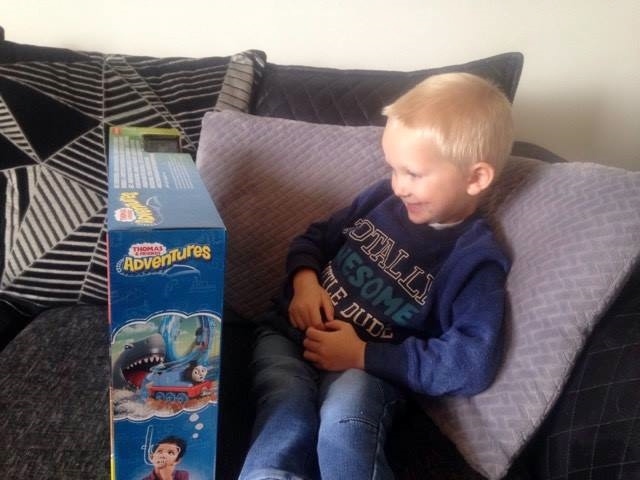 The box is really eye catching as it features Thomas trying to escape from the jaws of a shark. 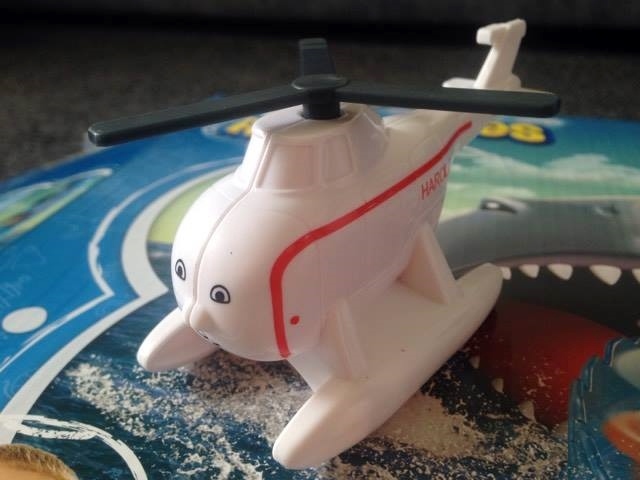 The main graphics show Thomas riding through the waves with the help of Harold the Helicopter and escaping from the shark. This gives you a basic idea of how you can play with the toy, with a much clearer image of the full track set up on the bottom right hand corner. You can also find the age recommendation of 3+ in the corner, and just above this is an advisory message stating that adult assembly is required. The top right hand side of the box is where you can find the die cast Thomas figure and the plastic Harold the Helicopter figures. It is great that these are visible on the outside as it gives you a better understanding of both the quality and size of the products included in the set. 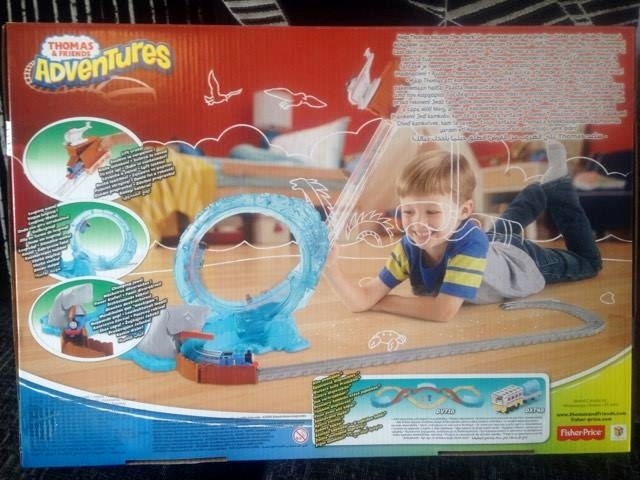 The reverse of the box gives you a much clearer understanding of how to play with the toy, and there is a large image showing a young child playing happily with the toy. 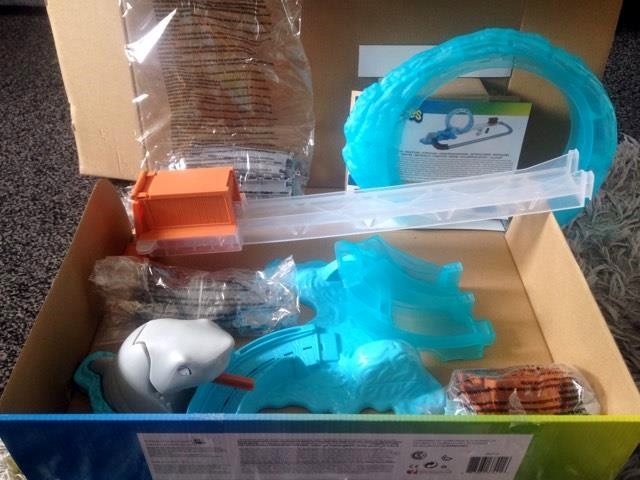 There are also a series of small pictures that highlight the main features of the toy which are the 'Lift Crate', releasing Thomas into the 'Looping Wave', and then watching him escape from the 'Chomping Jaws' of the shark. There was also a small advertisement for another product that is sold separately and also available for purchase. On opening the box we found numerous pieces and I was a little bit apprehensive of putting it all together. Self assembly is definitely not one of my best skills, however there are no tools required for putting it together and the instructions that were provided were relatively straightforward. There were three large parts and three bags which enclosed the different pieces of track. The plastic casing on the outside of the box housed the character figures and these were very easy to remove from the packaging. 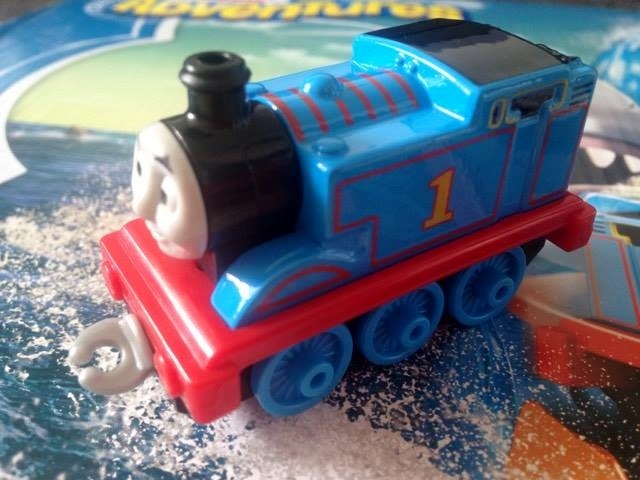 I felt that the two Thomas character toys were well made and had great detail. The Thomas train is made of diecast metal so is very hardwearing, and Harold the Helicopter is made of plastic and clips easily on to the lift carriage. Following the instructions I managed to build it all in ten minutes. Some pieces were slightly harder to slot together than others, and the small blue wave next to the shark needed a bit of pressure to clip it into place. It wasn't anything too difficult though and it was great to not have to mess around with tools or batteries to put it all together making the process very simple overall. Once built, my first impressions of the product were that it seemed a really good sturdy toy. The track and loop wasn't at all flimsy, and this reassured me that it could be played with over and over again without falling to pieces. The loop connected well together and didn't wobble at all even when Thomas was riding through the wave at speed. 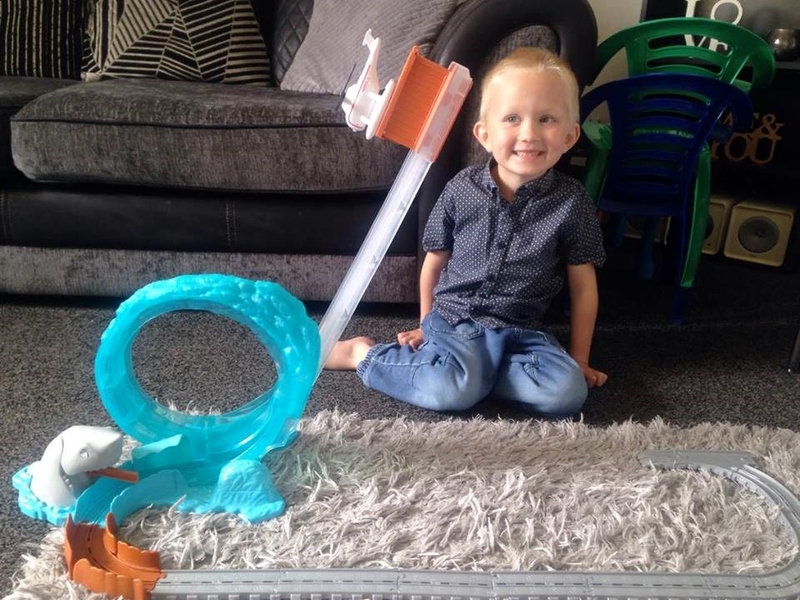 Riley was able to understand the concept of how it worked straight away and quickly placed Thomas into the lift carriage. With the help of Harold the helicopter Riley raised the lift carriage into position, ready to release Thomas into the wave. One thing I particularly liked was that when the lift carriage has been raised, it stays in place, so you don't need to worry about having to hold it and release Thomas at the same time. Riley was very excited to open the lift hatch to let Thomas go, and we were both surprised at just how fast he travelled through the loop-de-loop and escaped the sharks jaws. Once Thomas had escaped the sharks jaws then Riley did find the remainder of the track slightly plain, however he added other pieces from track sets we already had to make some tunnels, and also created a seaside in the middle of the track where he pretended all his toy figures were on holiday watching Thomas and Friends™. He also realised that some of his other toy cars and vehicles were the same size as the track and so he also enjoyed lining all the vehicles up and pretending they were all on a mission to save Thomas. On the reverse of the packaging is the statement "Go wherever your imagination takes you" and that is certainly what Riley has done with this toy. 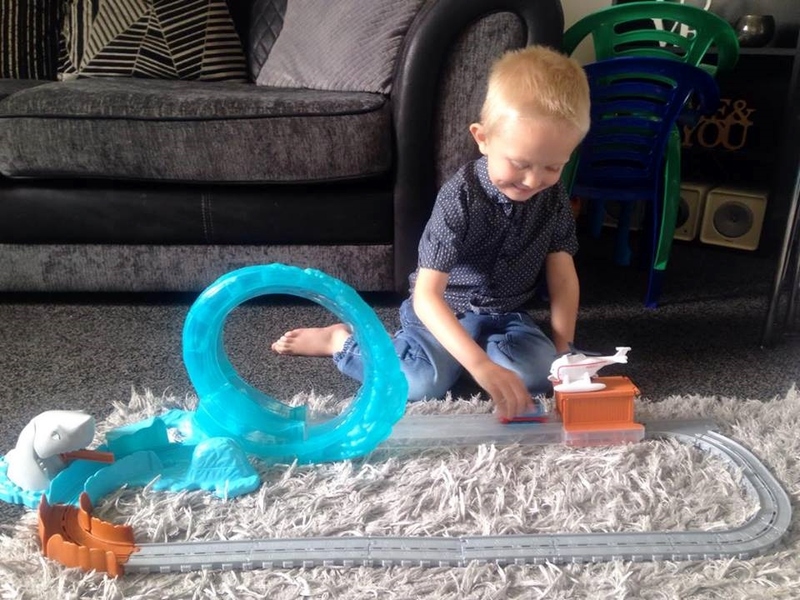 Riley enjoys playing with it on its own, but also by combining it with his other toys which was really nice to see. There is also a spare piece of track on one corner that allows you to connect it to other tracks in the range. This is a great idea, as it means you can build your collection up, and I bet the sets look amazing when all connected together with lots of different adventures to be had. Overall we both really liked this product and felt it was lots of fun and really good quality. 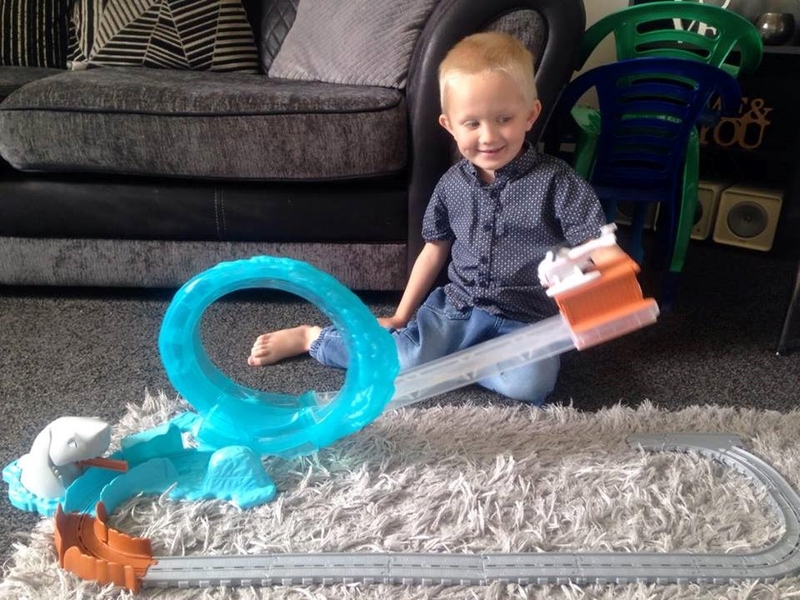 Although there was a large section of plain track, this allowed for a child to use their own imagination to turn the remainder of the track into whatever they wanted it to be, and if you already own other Thomas and Friends™ products then you can combine these together to make even more adventures. 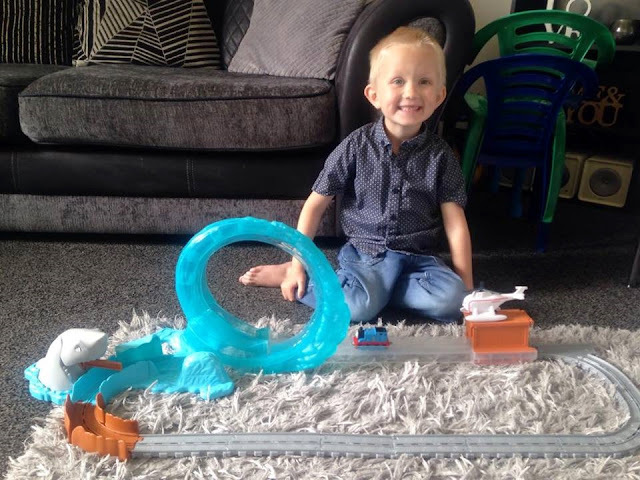 Riley enjoyed introducing some of his other toys to the play set, and since it arrived it has definitely been his most played with toy over the past week. It was easy to build and required no tools or batteries which are both big plus points in my opinion. 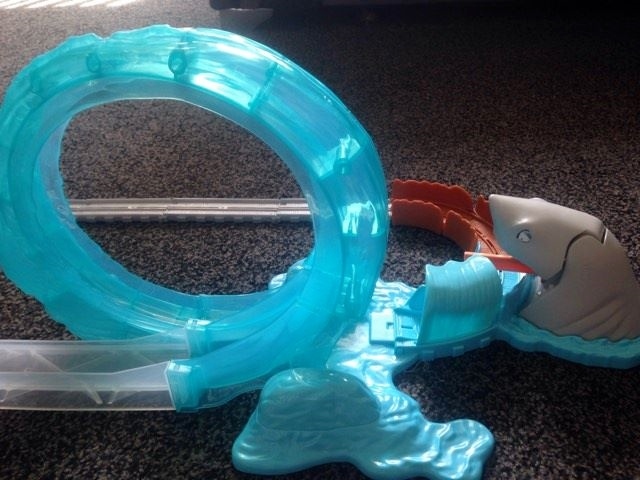 If you would like to purchase your own Thomas & Friends™ Adventures Shark Escape! 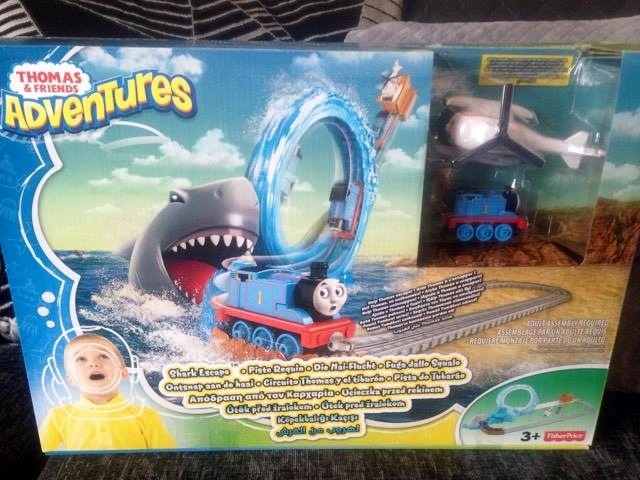 playset, then this is available from most good toy retailers or can be purchased here: Thomas & Friends™ Adventures Shark Escape! *Disclaimer - We were provided with this toy on a complimentary basis for the purpose of providing and honest review of the product. All opinions, photographs and views are my own unless otherwise stated.